← Can you trust a book review? Not hip enough for Elle. Who signed me up for Elle magazine, anyway? I subscribe to Elle Decor, which is full of ads for furniture I can’t afford, but at least I get a sneak peek at Reese Witherspoon’s house. But for some unknown reason, Elle is showing up in my mailbox, too. I’m not sure I’m hip enough for Elle. 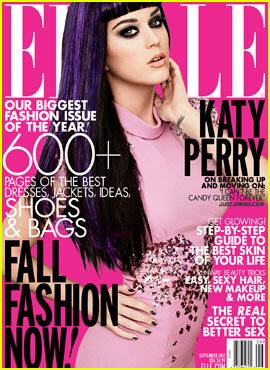 Elle has a lot of ads for clothing, handbags, jewelry, cosmetics, and perfume. (The September issue is the stinkiest I’ve come across in quite some time.) I’m not saying it has too many ads, but the table of contents for the September issue is on page 116. The magazine itself has over 600 pages. It’s like a Harry Potter book. I can actually afford some of the items advertised in Elle. OPI nail polish, for example. I have blue OPI nail polish on my toenails right this minute. I’m not quite sure where you would go to buy some of the clothing advertised. Fendi. I don’t think I’ve seen Fendi at Macy’s. Others, I do know where to go. There’s a Bebe store at the Water Tower mall. I’d be embarrassed to go in there, though. I imagine walking into Bebe and exploding into a sheet of flames as the 23-year-old shopgirls check out my Gap cargo pants and Chico’s blazer. The magazine’s articles aren’t terrible. There’s a touching one about a woman discovering how much she is like her mother, who died of breast cancer. An article about Naomi Wolf is as much about the author as it is about Naomi, but it’s kind of snarky, so I like it. An essay that’s sort of like the Ladies Home Journal column, “Can This Marriage Be Saved?” And of course, many articles about fashion. Elle also features lots of arty fashion spreads. So arty that it’s kind of hard to see the clothes, sometimes. In several shots, the women are spread across the page at an angle, lying down with their mouths open. I’m not sure what they are selling or to whom, but it makes me uncomfortable. This month’s issue features Katy Perry modeling an assortment of fashionable outfits from Etro, Versace, and Bottega Venata. (Price on request.) Whereas Katy usually looks healthy, friendly, and curvy – like your favorite counter girl at the Dairy Queen – she is looking skinny and very haute couture. She is not smiling in a single photo. Also, no cleavage. It’s like she has normal breasts, instead of the gigantic fantasy breasts she actually has. For contrast, here’s a photo of Katy looking like we expect her to look. Ultimately, I don’t think it’s the lack of hipness that’s doing me in, though. I’m simply not young enough. They print it with this itsy bitsy font. Maybe 8 point type. Even with my reading glasses, it’s tough to decipher. But at least I can rip out all the perfume ads and smell good for a week! This entry was posted in Commentary, Review and tagged Bebe, Elle Decor, Elle Magazine, Fendi, Katy Perry, Ladies Home Journal, Macy's, Naomi Wolf, Water Tower. Bookmark the permalink.